What if you could spend the day with a former VP at Citibank and Economic Advisor to President Reagan? Would you want to know where he invests his money? Where he sees the areas of business and wealth opportunities in the next one, two or three years? What if you could spend the day with a man who was the Valedictorian of Wharton Business School and multi-millionaire at age 26? Would you want to know what businesses he has started? His secrets for entrepreneurial success? What if you could spend the day with a man who’s advised some of the most successful retail corporations in the world on how to market and distribute their products? Would you want to know his favorite websites? What he buys and from whom? His ideas for getting the best value for your money as a consumer? What if you could spend the day with a man who has done definitive research on the next trillion dollar industry-The Wellness Industry? Would you want to know what he thinks the trends will be for this remarkable industry in the next ten years? How about his advice on starting a wellness business of your own? Or, how your existing business can take advantage of these trends? What if you could spend the day with a man who made millions in his twenties, advised Presidents in his thirties and decided to slow down and start a family in his forties? Would you be interested to hear his definition of “true wealth?” Would you want to know how he integrates a high quality family life, with a high-stress professional life? 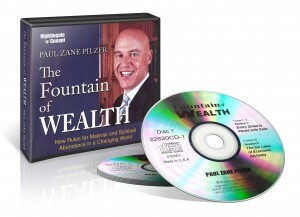 In this life-changing program, The Fountain of Wealth, you will spend a day with a such a man-his name is Paul Zane Pilzer. Most people know Paul as an economist, who covers the global issues that affect all of our individual lives. But here, for the first time ever, Paul will share his personal secrets for success-a side of Paul only his students at New York University have ever been able to witness. Never before has all of this “insider” information been organized in one place, in one incredible product, presented in an organized way with one central purpose in mind: increasing your personal wealth and happiness. How to “quit, before you’re fired” and other new rules for career success. Why the distinction between “entrepreneurs” and “employees” has been blurred. The “fifty percent rule” for deciding whether to leave your current employer. The new financial strategies for the new economy; including mutual funds, real estate, tax-deferred vehicles, and intellectual property. Why the concept of “retirement” was an anomaly, and not even desirable. How to stake your claim in the next trillion-dollar market. How to take advantage of the wealth of choices on the internet. Why in the new economy, contrary to popular wisdom, community and relationships have never been better. How to get more of the wealth that money can’t buy. Finally, in one place, you have an OPERATING MANUAL FOR SUCCESS IN THE 21ST CENTURY. The Fountain of Wealth will completely revolutionize the way you see life-as a businessperson, as a consumer, as a parent, and as a spiritual being.